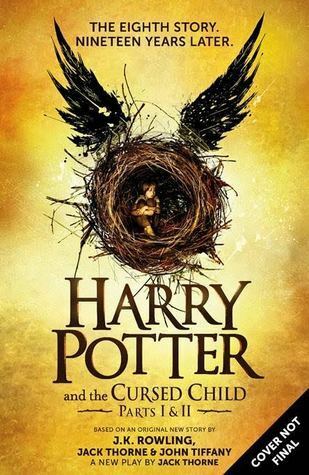 This week I'm waiting on Harry Potter and the Cursed Child by J.K. Jowling, Jack Thorne, and John Tiffany! The second I heard there was going to be a Harry Potter based play in England I freaked out and started pestering my mom to send me (I'm still working on it, pray 4 me guys). While I was working on that, I guess Jo and the scriptwriters heard all the cries that the majority of the fanbase was missing out on the story and decided to give us the full script in book form, and when I heard about that I immediately rushed to find out the details about pre-ordering and length and the like. The book is about Albus Severus -- Harry's son, if you've been living under a rock and weren't aware -- and if we're being real I was lowkey hoping it was going to be a Marauder's era story even though 1. J.K. Rowling stated multiple times that Cursed Child would definitely not be a Marauders era story and 2. I have such a specific idea of what I believe the the Marauders were like and what I'd feel a Marauders era story would be like that I don't think anything could live up to what I have built up in my head so I suppose it's a good thing it wasn't. Honestly, I'm in so deep that any new Harry Potter news makes me jump for joy and this is no exception. While Harry's kids weren't at the top of my list for eighth book ideas, you have to understand that that even so, my excitement levels are through the roof, and I am by no means disappointed. I'm just waiting it out until July 31st, when I will blow a candle on Harry's honorary birthday cake and crack open this brand new (set of) chapter(s). This book was nothing short of artwork. I bought I'll Give You the Sun on a whim, because I was in Barnes & Noble (as I often am) and it was shiny and I'd heard it mentioned a few times, but I really was just expecting a cutesy contemporary novel about ~sibling love~ and also for some reason I had it in my head that there was a road trip involved although that's not actually a thing that happens. Anyway, the book ended up going so much further than just "cutesy YA" and I really found myself experiencing a range of emotions as I read, from heartbroken to frustrated to joyfully devastated (trust me that last one is real). I'll Give You the Sun is told in alternating perspectives -- through twins Noah and Jude. 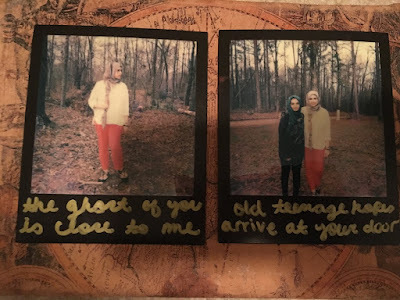 Jude narrates her story at age 16 and Noah narrates at 13.5/4, so we jump back and forth between the point in their lives we're viewing, but the chapters are long so it never gets confusing with having to keep track of anything. I kept getting so engrossed in each section that I would read one and once it switched narrators I'd think "Ugh I liked the perspective I was already reading better, I don't want to switch narrators" and then I'd read the next chapter and I'd think the exact same thing about the other twin. I also kept sympathizing with each twin when I was reading their parts. So like, Noah would be complaining about Jude and I would vehemently hate her in that moment, and then ten minutes later I'd be reading about Jude all full of regret and hope and I'd get ready to fight any ghosts who tried to mess with her. Their mistakes and decisions all just felt really human and it balanced out the way the book was a little over the top as a whole so it meshed together really well. "At the mention of Dad's name, all the paintings, mirrors, family photographs come crashing down from the walls. Again, only I notice....I close my eyes for a second, see the roof whip off the house, reel across the sky." These things aren't actually happening and the roof is where it should be and the paintings are still on the wall, but it serves to highlight the emotional wreckage of what's going on. The first time there was an instance of this exaggerated "it didn't really happen but I'm saying it did for effect" writing, I'll admit I was a little confused but I quickly got used to it. There were parts where Noah describes an ongoing storm as flooding everything around them for eternity, but wherever their mom stands is dry and sunshiney. Or when something exciting happens to him in one scene and he describes it as going blind and then follows with "The blindness lasts just a second, then the colors start flooding into me: not through my eyes but right through my skin, replacing blood and bone, muscle and sinew, until i am redorangebluegreenpurpleyellowredorangebluegreenpurpleyellow." I really liked these exaggerated descriptions because 1. they were fun to read and they really added to his voice and 2. a lot of the time when I'm talking to my friends I get really exaggerated with things I say too and tell them things like how I think I've stopped breathing and am probably a corpse, so it helped me relate to the character. "SELF-PORTRAIT: Boy Remakes World Before World Remakes Boy"
"LANDSCAPE: When God Paints Outside the Lines." "To bring back joy over a grieving family member, sprinkle three tablespoons of crushed eggshells over every meal." "Write your sins on apples still hanging on the tree; when they fall away so do your burdens." Honestly, the writing was just so tremendously good that I can't even pick favorite quotes to show y'all because not only are there so many gems, but each one I mention will launch me into a page long spiral about it. I loved the story and all it encompassed, too. Though the chapters were 2.5 years apart, everything connected so well. Characters popped in and out of both sets of years and we got to explore what tore the twins apart from not only both sides, but also while it was happening and after the fact when it was trying to be remedied. It wasn't heavy on plot in a sense that "the characters have to do this thing to complete this journey" and a great deal of it was spent on the story that already happened, although this doesn't mean it was short of subplots and drama and things happening. I liked the amount of things that happened because it stopped it from being gimmicky or just ~too much~. Also, the book had a huge focus on art and it was all just really cool. From the astronomy-loving boy who moves in next door to the giant behemoth of a sculptor who takes Jude under his wing, every character was wonderful and I loved them all (even the ones I hated) and I honestly could say so much about this book, but I really think everyone should read it and experience the story for themselves. Does your soul feel connected to anyone else's? 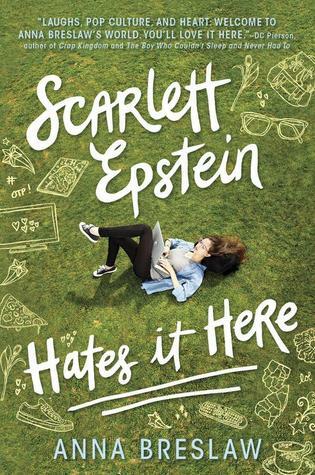 This week I'm waiting on Scarlett Epstein Hates It Here by Anna Breslaw! When Scarlett’s beloved TV show is canceled and her longtime crush, Gideon, is sucked out of her orbit and into the dark and distant world of Populars, Scarlett turns to the fanfic message boards for comfort. This time, though, her subjects aren’t the swoon-worthy stars of her fave series—they’re the real-life kids from her high school. Scarlett never considers what might happen if they were to find out what she truly thinks about them...until a dramatic series of events exposes a very different reality than Scarlett's stories, forever transforming her approach to relationships—both online and off. 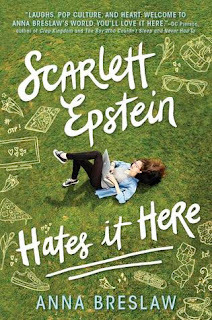 Based on the blurb and some of the reviews I've seen so far, Scarlett Epstein Hates It Here sounds like a book I need to get my hands on. Scarlett seems like she'll be an interesting female protagonist, and I've heard the book is hilarious. This is definitely a debut I can't wait to read! Thanks to Delacorte Press and First in Line for the ARC I received at Yallfest! I have no idea how to talk about this book, but I'm going to do my best because I need to talk about this book and how amazing it is. 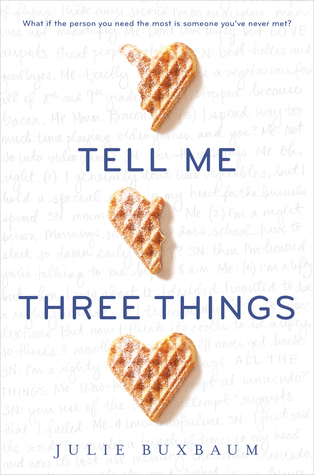 After reading the blurb for Tell Me Three Things I was immediately intrigued. At the beginning of the book, Jessie has just moved to Los Angeles and is dealing with a lot. It's been about two years since her mother died, and her father has just remarried and relocated them from their old life in Chicago. If that wasn't bad enough, she's starting her junior year at a fancy prep school where she is struggling to fit in. Luckily for her, an anonymous friend wants to help her get acclimated at her new school. While Somebody Nobody could be an elaborate catfish, Jessie ends up finding a true friend through their conversations. There's something so relatable about Jessie. Even if you've never lost a parent or moved to a new school or had an anonymous online friend, it's easy to connect with her feeling of not belonging. At its roots, Tell Me Three Things is Jessie's coming of age story. The way Julie Buxbaum portrayed such a wide range of emotions through Jessie was absolutely beautiful, and I think there's something everyone can connect with. One of the most gripping parts of Tell Me Three Things is the mystery of who Somebody Nobody is. While I had my guess somewhere in the middle, Julie Buxbaum did an amazing job at keeping me guessing the entire way through. I actually shouted "NO WAY" at one point because she had me convinced I was wrong. As for the romance aspect of the book, it was absolutely adorable!!!! (I had an English teacher once say that you should rarely use exclamation points in formal writing, and when you do you should only use one, but honestly it was so adorable the extra exclamation points were entirely necessary and I stand by them.) There was so much "aw"-ing and swooning while reading this. I loved how the connection built and the friendship bloomed into the romance. Honestly, I have no complaints about Tell Me Three Things. I knew after the first paragraph of this book that I was going to love it, and it exceeded my expectations. 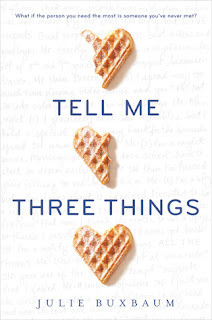 With a wonderful balance of mystery, romance, humor, and heartfelt moments, Tell Me Three Things is absolutely a must read and is now one of my all time favorites! Bonus: I'll tell you three things about myself! Tell me three things about yourself in the comments! Previously on We Live and Breathe Books all the bloggers died and disappeared. (I was trying to figure out a way to incorporate a joke about it being last season, but I'm just not that funny.) The last time we did a Previously post was for September 2015. A lot of time has passed since then, with all of us taking some time away from the blog, but now that we're back (well, Kiersten and Noor for now), I figured we might as well get back into these Previously posts! 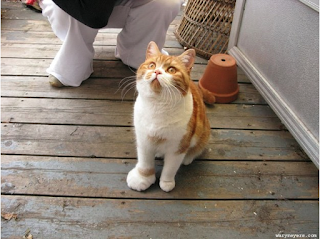 February: Was that a finger twitch? 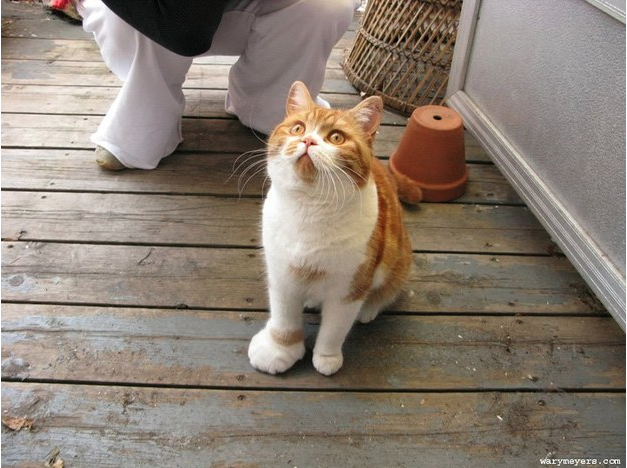 Oh, nope. Still dead. March: WAIT - I THINK I SEE LIFE! 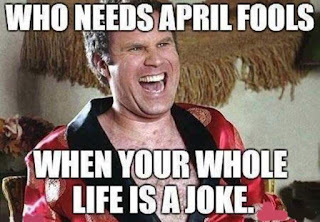 Happy April, everyone! I promise nothing in my section is an April Fool's Day joke. Wow, this year has been crazy. For real. Now that the show I was designing and my dance show are over, the rest of this semester should be smooth sailing. I'm taking a lot of statistics classes right now for my applied statistics minor, and I've found that these classes are actually a lot less time consuming than my design classes. I love that I can finally get back to reading and blogging! I didn't realize how much I missed it until I started again over spring break. March absolutely flew by. The first weekend was my dance show, and I also got to meet Fall Out Boy and see them in concert! 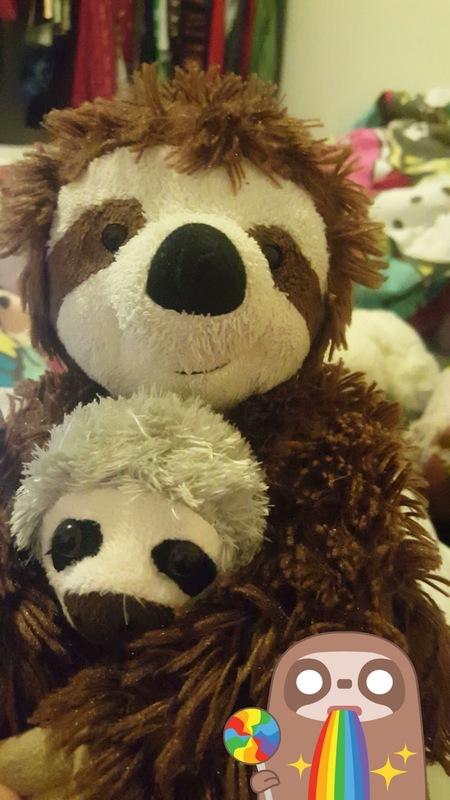 In other news, if you missed it in my latest Stuffed Animal Sunday post, Sloth has a new friend! His name is French Fry, and he is a nice little sloth! I have no idea why this was a geofilter on Snapchat, but Sloth liked it because sloths and rainbows are his favorite. AND in the most exciting bit of news, the Syracuse University women's and men's basketball teams both made it to the Final Four (which is a big deal if you don't know college sports)! Campus is so much fun right now with all the excitement. I don't know what the outcome will be on Saturday, but it's honestly pretty crazy that we've made it this far (especially for the men's team being the first 10 seed to ever make it to the Final Four). It's going to be an exciting, and hopefully successful, day! March 2016 aka the start of me reading again! I finally finished Queen of Shadows, which I had started during winter break but had to stop half way through to do school work (sads). I also finally finished The Heroes of Olympus series, which was bittersweet. Tell Me Three Things is now one of my favorite books of all time (check it out when it comes out on the 5th), and The Darkest Corners was also incredible! Unfortunately, A Thousand Nights taints this amazing month of reading, being the first book I've abandoned that wasn't assigned reading. This April TBR might be somewhat ambitious but it's not like it actually matters if I read all the books I say I want to read this month. I've actually already started Into the Dim, and I'm really enjoying it so far! Illuminae is an ARC I got at BEA last year but never got the chance to read, so I really want to prioritize it this month. To be honest, I really only decided to add The Wrath & the Dawn when I saw that Noor was planning to read it this month because ~potential double review fun times~ and it just so happens that I got it not that long ago. Playlist for the Dead has been on my radar for a while, and I just think I'm really in the mood for that one right now. Last but not least, I am so overdue for reading Shadow and Bone - I actually own the entire series and Six of Crows, so I really need to get on that. You know how on Snapchat if you make a video you can speed it up or you can super speed it up? I feel like someone took the last few months of time and stuck them in the super-speed filter and made them too fast for me to decipher what was really going on but it's April and I don't know how that happened but we're here and we're just gonna go with it. 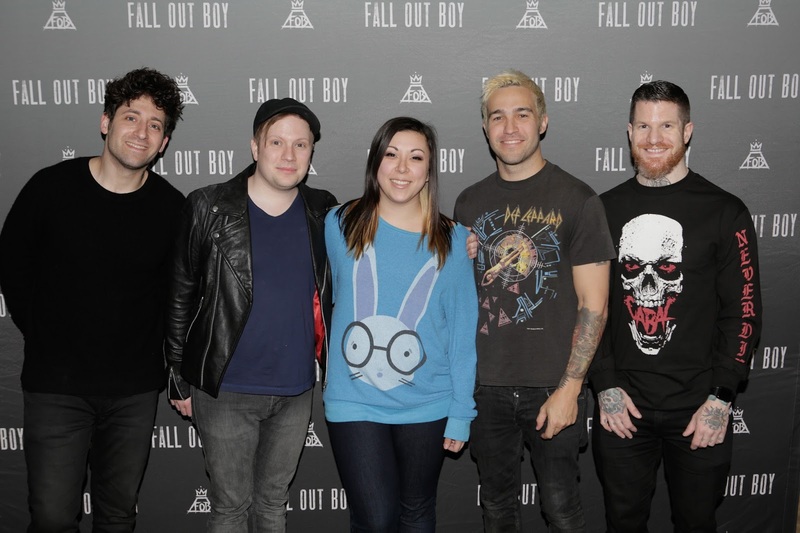 Also, I too can relate to Kiersten's first image. 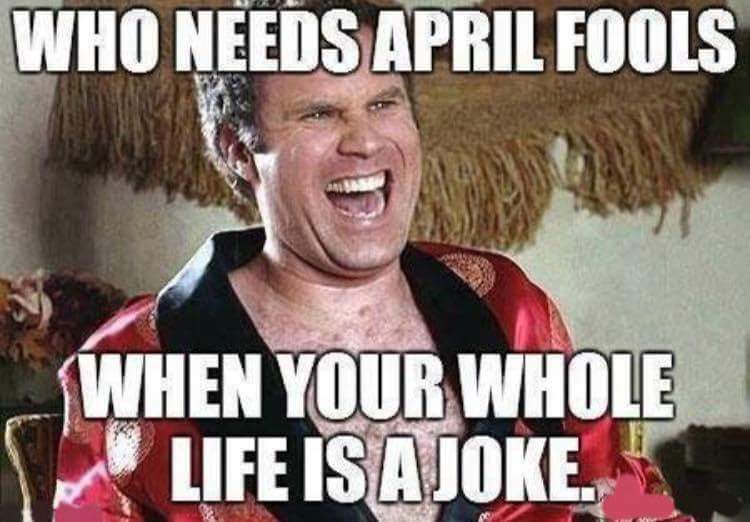 I don't need jokes because I'm the joke. Anyway, sorry about the huge chunk of text about my phone up there. The rest of my trip was pretty rad. I ate really good burgers which I was supremely grateful for because there was a really good burger place here that closed down and I've been craving a phenomenal burger ever since and I was not disappointed. Also I rode around the mall on those large fuzzy animal robot things for kids. And I ate a lot of s'mores and explored in the woods and ate deer for the first time but those are all pretty much givens and definitely not as important as the burgers and the fuzzy kids rides. 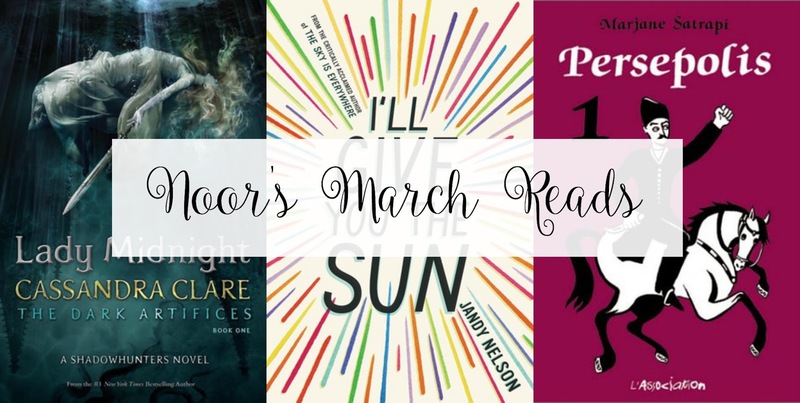 Anyway, before I move on to March Reads, I just want to say that it's April, which means it's National Poetry Month! Woo! I'm going to try to write a poem a day -- starting with a poem about Paris Geller from Gilmore Girls -- because honestly I haven't written in a long time and this is a good excuse to go back, so if any of you want to join me, let's have fun writing times together, shall we? Whereas Kiersten started reading again in March, it's been a slow decline for me, with only three books. But hey, it's better than none, right? I just posted my Lady Midnight review so if you're keeping up you should know that I'm just utterly and truly in love with it. Honestly, Cassandra Clare can keep writing Shadowhunter books until her dying day and I will keep buying them and soaking them in. 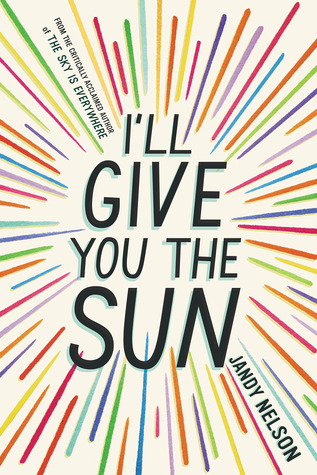 I mentioned in our last Top Ten Tuesday that I'll Give You the Sun was a five star read and I want to review it soon and tell you all why because it was truly one of the best contemporary books I've read in a while and I'm so grateful I finally read it. My most recent read of this month was Persepolis, which is a memoir written in comic form and while it's not a YA book, it tells the story of the early teen years of the author's life in Iran and because of the way it's written and the way the author tells her story, I think a lot of YA fans would enjoy her graphic novel memoir. I didn't want to aim too high and put like seven books and then only read one but I didn't want to admit defeat by only putting like two so I figured I would aim to read one more book than I did last month. Okay, so I didn't even know Kindred Spirits existed until like last week, at which point I knew I needed to read it because, hello, it's Rainbow Rowell. It's apparently a short story (96 pages) she wrote for World Book Day and I can't wait to get my hands on it. Moving on, when I first heard of Salt to the Sea I wanted to read it solely because it had a pretty name and cover, and then I wasn't sure because it's a historical fiction set in 1945 and I wasn't sure if it would be my cup of tea but then I kept seeing so many positive reviews that my curiosity is getting the better of me and now I really want to read it again. Red Queen has been on my to-read list for ages but the second book came out in February and now I feel obligated to read it soon because if I don't the series will pile up and become intimidating and I won't ever read it. So Kiersten touched upon the disappointment of A Thousand Nights and because I don't want to give up hope that a gripping 1001 Nights retelling is out there and I think that if I read that one I should read The Wrath and the Dawn and now that the sequel for it is out I don't want the scenario I mentioned with Red Queen to happen and also people just keep mentioning how good it is so I hope to read it this month.